ESSA – The US government shutdown – any end in sight? Really, there isn’t anything else that can be said about the latest fiscal crisis in the United States. 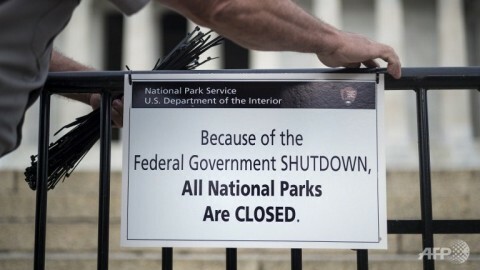 With the federal government shutting down most operations on the 1st of October, as the House of Representatives (controlled by the Republicans) and the Senate (controlled by the Democrats) couldn’t agree on a Continuing Resolution for the 2014 fiscal year. This entry was posted in American Politics, Barack Obama, Congress, Debt Ceiling, Economics, ESSA, Fiscal Policy, Government Shutdown, Health Care Reform, Obamacare, Policy, Tea Party, Ted Cruz by christopherweinberg. Bookmark the permalink.